Frank bretschneider (GER), Lia (AUT) and emi maeda (JPN). Phonophani has a new track out for free download, as part of the internet compilation "post awakening sound". Visit and download here. I was searching for something in the basement, when I suddenly fell into a trap door, and for a minute I heard this special music. The second release in Enlightenments series of 3" CDs presenting the finest in adventurous leftfield music. The disc features 4 tracks of sparkling sweet Meland music and a remix by Phonophani. Andreas Meland has been active in the norwegian experimental music scene through a number of years with numerous memorable concerts in Norway and abroad, and a string of limited edition releases. In addition to this he is a hyperactive concert and festival organiser and also runs his own label Melektronikk. His music has been applauded for it's generous complexity and tasteful mix of warm, layered acoustic drones and electronics. Andreas is also a member of the trio düplo and the duos Sort Mel and Bokfink (with Dag-Are Haugan of Alog fame). He has also collaborated with Lasse Marhaug, Alexander Rishaug, Fe-mail, Low Frequency in Stereo and many more. Is a young, label for adventurous music and art, made by nice people. Deaf Leoppard is the Second in a series of 3? CDs, presenting the very finest experimental music we know. Enlightenment is currently run from the small town of Trondheim, Norway. 3. june - Phonophanis "feu de camp électronique" performed live at Ronchamp Chapel, France. 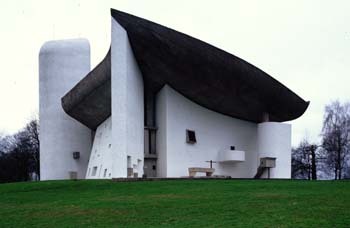 Celebrating the UNESCO status of the famous chapel, phonophani will compose and perform a special piece based on the ideas and techniques of architecht Le Corbusier and his collaborator Iannis Xenakis. It will be performed in quadrophony outside the chapel and also diffused on a 24 loudspeaker acousmonium inside the building. The title "feu de camp électronique" is a rephrasing of Edgar Vareses title "Poème électronique", made for Le Corbusiers and Xenakis´ Philips Pavillon. A campfire is a piece of virtual architecture which creates a sense of home, but with invisible walls, to the people that is sitting around it. Phonophanis electronic campfire will light up outside the Ronchamp chapel, at 20.30h on 3. june. It will also be aired live on French radio station France Culture. Coreographer Johannes Wielands latest piece "Die zehn Gebote" featuring original music by Phonophani will premiere on May 20. at Staatstheater Oldenburg, Germany. Phonophani has composed and will perform a bollyfoni at this years Borealis festival in Bergen together with Sigbjørn Apeland on organ. 18. march on Landmark, combining the wonderous world of bollywood dance scenes with electronic music, an homage to the greatest bollywood director: V.Shantaram and his music director-duo Laxmikant Pyrelal.